PRESS RELEASE: Amsterdam, Netherlands – April 8, 2019 – Land Life Company (https://landlifecompany.com), a leading reforestation company and Shell today announced the launch of a new, data-driven reforestation project in the Castilla y León region of Spain. As one of Shell’s new investments into nature based solutions, the reforestation project funds the planting and monitoring of 300 hectares of degraded land in 2019 by Land Life Company. “Shell’s investment in our reforestation project will help restore land degraded by overfarming and wildfires. 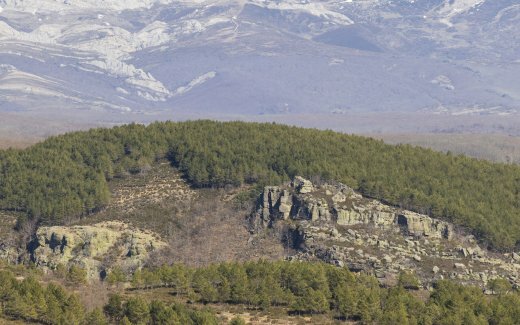 The new forest will remove over 55,000 tons of CO2 from the atmosphere, increase biodiversity and encourage the return of investment to one of the most beautiful parts of Spain.” said Ruys. In 2019, Land Life Company will plant over a million trees, reforesting over 1,000 hectares, worldwide. “Natural ecosystems, such as forests, help humanity in many little understood but critical ways, from addressing climate change to biodiversity and air quality. Land Life’s technology-driven approach creates opportunities to increase the scale and performance of reforestation globally,” said Duncan van Bergen, Vice President of Nature Based Solutions at Shell. Land Life’s technology is used across the reforestation value chain. Before planting, data is compiled from satellites, UAVs, climate models and soil samples to optimize planting designs and maximize tree survival. GPS-led automated planting systems are then used to reforest at scale. Trees are tracked, traced and monitored through a combination of remote sensing, AI and distributed ledger technologies. The Land Life database fuels the Company’s innovation roadmap and provides customers, such as Shell, with insights into forest growth and impact achieved on the ground. Land Life Company was founded in 2013 by former McKinsey partner Jurriaan Ruys and the founder of Bugaboo International, Eduard Zanen with a shared conviction that innovation and technology are critical to addressing land degradation within our lifetime. The technology-driven reforestation company is on a mission is to help reforest 2 billion hectares of degraded land globally and has led both large-scale and iconic reforestation projects in 25 countries around the world. In 2019 alone, Land Life Company will plant over one million trees. Land Life is on a mission to reforest the world’s 2 billion hectares of degraded land. A new way to fix the planet, for this generation and the next.